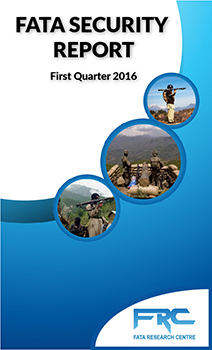 The Taliban-led violence in FATA is on the rise since the start of 2016, says “FATA Security Report First Quarter 2016” published by the FATA Research Centre. There has been an increase of 34 percent in violent incidents compared to the last quarter of 2015. According to the report, 42 percent of Taliban attacks employed IEDs, while 26 percent involved ambushes on security forces and anti-Taliban elders. However, casualty ratio in these violent incidents comprised mainly of the terrorists – 64 percent of the total number – which signifies effectiveness of the counter-terrorism measures employed by the government. The Mohmand Agency recorded the highest number of terrorist attacks, while North Waziristan witnessed the highest number of counter terrorist operations.